The Encinitas City Council and the Planning Commission just finished playing a double-header, devoting two full evenings last week to the contentious issue of more housing density in our community. We are considering changing our zoning code to allow more density in a few select spots in order to comply with state laws. The struggle over how and whether to do this has dominated the political discourse in Encinitas for many years. The reason we’re even talking about this is because the state requires that every city provide a certain amount of “affordable housing,” and Encinitas isn’t zoned for its fair share. Affordable housing is needed for all sorts of people who work in our community already. Someone who works full-time at minimum wage in Encinitas earns about $20,000 for the year. Some jobs in this income category include food service workers, child care providers, grocery clerks, EMTs and many young families just starting out. Encinitas is the only city in the county that doesn’t have a zoning plan for the future that would allow for new affordable housing to be built. State law requires the city to have a plan, and as a lawyer and elected official who believes in the importance of the rule of law, I think we need to comply. I don’t want other cities avoiding child labor laws or traffic laws because they don’t agree with them. I also don’t want us to face expensive lawsuits because we are out of compliance. Those who are unhappy about state laws that link high-density housing to affordable housing should lobby for change at the state level. The local office number for our state Assembly Member Rocky Chavez is 760-929-7998. Our state Senator Pat Bates can be reached at 916-626-6804. Politicians love to hear from their constituencies, so please reach out if you dislike this state law. The critical thing is that whatever new zoning we allow has to result in affordable units being built. This “nexus” will be the subject of future City Council meetings. The ultimate plan will likely involve some parcels being rezoned, plus a more robust counting and incentivizing of the city’s accessory dwelling units (granny flats or converted garages) because those also produce affordable housing. 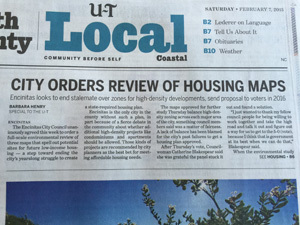 Any changes to the zoning code must be approved by the voters. It’s clear to me that a ballot measure doesn’t stand a chance of passing in 2016 if the City Council isn’t 100% behind it. We need to get our own house in order first. The messiness of politics comes from the true philosophical differences among any group of five people, but interpersonal relationships and group dynamics are also involved. We had two marathon meetings this week and at the end of the first one, the vote to move forward was 3-2, with Mayor Kristin Gaspar and Council Member Mark Muir voting no. I’ll admit that this vote stunned me because I had believed that we were working from consensus to get something on the 2016 ballot that the Council could support. I was clearly wrong. Being new on the Council, I didn’t foresee this or understand what was happening. We are supposed to do the public’s business in public, so there we were. I was incredibly heartened when the Mayor and Council Member Muir spoke up, expressed their reservations and concerns, and then indicated an interest in proceeding forward with the planned meeting. I was equally pleased and impressed that Council Members Tony Kranz and Lisa Shaffer asked questions, listened and also were interested in continuing to move forward. I think we all agree that the end goal is the most important thing and we are willing to do what it takes to get there. At the end of the meeting, we voted 5-0 to send three potential housing maps to environmental study. This is a major milestone. Click here for the San Diego U-T article from the front page of the local section on Saturday. My overriding feeling is that I’m proud of us as a City Council for wrestling with a difficult, contentious subject and being able to figure out a path forward. While some feel that bipartisanship is naive, and accused me of either pandering or being played, I don’t share that feeling. I feel great about the consensus we were able to reach on this most important city issue. Without that foundation of consensus now, I don’t believe we would find it later in the process. The housing-related challenges are far from over — in all honesty, they have just begun. I can’t predict how this process will end, but I feel that after this week we are on the right path. Previous Post1/25/15: Inside the City CouncilNext Post2/13/15: A 5-0 Vote on Pacific View! Yippee!